The transport of the motorbike by air or by sea? The portal ‘Horizons Unlimited’ has created an interesting service which is dedicated to the transport of one’s own bike from one continent to another, comparing the pluses and minuses between air and sea services..
Maritime transport is undoubtedly the most economical… but the port taxes are high, often to the extent of canceling out the initial savings, without taking into consideration the inconvenience of being ‘bike-less’ for weeks or even months since the vehicle needs to be left with the shipping agent in advance. But this isn’t the sole negative aspect: the time frames given between the departure and arrival of the vehicle at its destination are never exactly 100% reliable. To give you an example, sending a bike from Vancouver to Europe takes about 6-8 weeks. However, experience proves this not always to be the case. If during transit, there needs to be a deviation, for example to Nigeria, the increase in time can easily reach 12 weeks. And then there are of course port strikes…. We know of a motorbike traveller that organized the transport of his vehicle from the UK to Ecuador, delivering it to the shipping agent 3 months before his planned holiday: on his arrival in South America he found out that the South American branch of the navigation company knew nothing about his motorbike …. which was still in England awaiting a place on a cargo ship. Air transport is more expensive, but when talking about the timeframes they are definitely more reliable. Of course delays happen …. but usually only in terms of a few days. Usually there are different kinds of problems: some US airlines are becoming paranoid about transporting motorbikes – classified as ‘dangerous cargo’ – and often refuse to do so. The best thing to do, if you choose to go or leave from the USA with your own motorbike on a flight, is to call – pay attention – the airline’s department of transport (if you call the official number of the airline you will almost definitely receive NO as the answer). Only the cargo department can provide you with the right one. By searching online with a phrase like “air transport of dangerous cargo” you might find useful solutions of methods on how to face the problem. To work around the US restrictions you could go to Canada, as many motorbike travelers do. Air Canada has a great deal of experience in transporting 2 wheeled vehicles and generally you can negotiate the transport with the cargo personnel on the day of your flight at the airport (not with the personnel at the check-in). Lufthansa and other European airlines, like South American of Asian airlines, generally accept the transport of motorbikes. However, it may be worthwhile to employ the services of a travel agent (the cost varies from country to country), so that they can handle all the bureaucratic details. For a good description of the process of preparing your bike to be transported (the packaging), we recommend reading the article by Christopher Connely (ultimate journey). 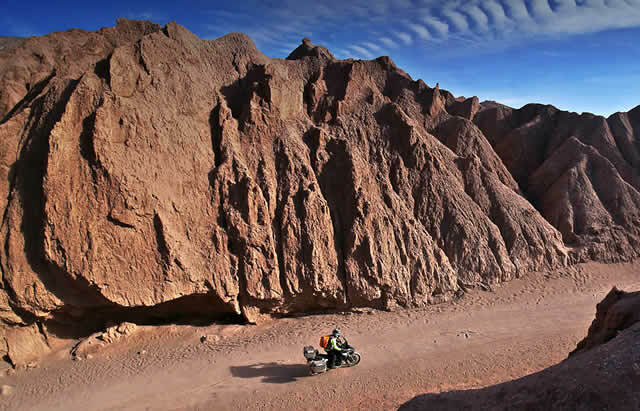 A motorbike traveller that sent his own bike to Chile, to Valparaiso to be precise (near Santiago), paid just 7 US dollars! to clear it through customs. The whole process was completed in a day since the offices are right next to where the cargo arrives in the crates. Other interesting comments can be found at the end of the original article on the site “Horizons Unlimited”. It goes without saying that the motorbike must be secured by disconnecting the battery and securing the spark plugs with tape, emptying the petrol from the tank (some companies permit you to leave a litre so that you can reach the first petrol station on arrival). What counts more, is that the shipping costs are determined not by the total weight, but rather by the volume of the crate it’s in. Leaving the front wheel in place means a higher cost since the crate will need to be bigger. But at the same time it means you don’t waste time upon arrival. Usual practice is to remove the side mirrors and the windshield. It depends on your budget. Example: 225 x 100 x 115 = 2,587.5cm3, divided by 6 = 431 Kg. If your bike weighs less, you will be charged the amount using the formula anyway. Useful information on these topics are supplied directly by motorbike travelers all around the world at Shipments by Travellers Database. On this page, you can find out details on transport via air or sea, based on departure and arrival locations. Costs, senders, delivery, personal experiences, timeframes, packaging requests, bureaucratic requests, and so on.